“It’s not a classic romantic comedy,” says writer Nancy Meyers (Private Benjamin and Father of the Bride) in a Variety article. “There’s no meet-cute, no boy gets girl, boy loses girl. It’s about a husband and wife who have a loving, playful, smart-aleck relationship that gets stretched and pulled and put to the test when the wife takes her husband and his beliefs on in court. It’s original, smart writing that really examines what goes on in a relationship behind closed doors – who wears the pants and all that. It’s timeless.” The husband-wife team of Garson Kanin and Ruth Gordon wrote the screenplay, as they did for Pat and Mike. 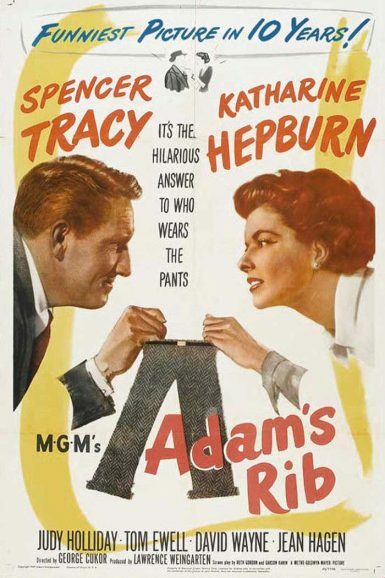 Both films were nominated for an Academy Award for Best Screenplay.